The sun is not just at the center of our solar system; it’s arguably at the center of our lives. We literally revolve around this enchanting ball of light, and it is the primary source of energy on Earth. It’s also, unfortunately, a deadly carcinogen that’s trying to kill us all with ultraviolet rays. Do I seriously have to wear it every day? ’Fraid so! Sun damage is cumulative, meaning whenever a UV ray hits your skin, it goes into a bank account that your body could cash in later for all these wonderful prizes and more: melanoma, malignant moles, premature wrinkles, age spots, and possibly DEATH. But I’m not trying to scare you or anything, because you can help prevent ALL of that stuff by…wearing sunscreen! A good sunscreen works by protecting you from the two types of UV rays that assault your bod on the daily: UVA and UVB. Both are villains, but they have different evil specialties. UVB is a short-wave ray whose specialty is giving you horrid sunburns by damaging the skin’s surface layers. UVA is a long-wave ray that gives people leather-face by penetrating deep into the skin. The other thing about UVA rays is that they can go through glass, so you’re not always shielded from them inside a house or car. Both kinds of rays are associated with skin cancer. How much should I put on? For your face and neck, use a blob the size of a nickel. For your body, you’ve maybe heard that you’re supposed to slather on about two tablespoons, or a shot-glass’s, worth? As if anyone’s going to dump their sunscreen into a shot glass before applying it. And then rub it in. You’ll be using a little more than the recommended amount, but that’s better than not enough. SPF = sun protection factor. It’s a system used in the U.S., Europe, and other parts of the world to measure how long you can expect a given sunscreen to protect you from the sun. With an SPF of 15, for example, you can spend 15 times longer in the sun without damaging your skin than you can without it. Unfortunately, the SPF system is flawed and confusing. First of all, the SPF number indicates the amount of protection you’re getting from ONLY UVB rays. Second, it doesn’t consider that the majority of people aren’t applying nearly enough sunscreen to get the stated amount of protection. If you’re only dabbing it on, an SPF of any number ends up giving you less protection than you think. Hopefully we’ll have a better system soon, because we need one! Between 30 and 50 is recommended. The sunscreens that go way into the SPF stratosphere (like SPF 100 or whatever) don’t really protect you that much better than the SPF 50 ones, which filter about 98 percent of the bad stuff. 1. There are two types of sunscreen agents: chemical and physical. Chemical sunscreens absorb into the top layer of your skin and soak up UV rays before they hit your precious skin cells. Physical sunscreens are inert minerals that just straight-up sit on top of your face to form a wall between your skin and the sun. Physical sunscreens can be kind of thick and yucky because you’re basically rubbing UV-reflecting mud all over yourself, whereas chemical sunscreens are mostly see-through after they sink into your skin. They all pretty much work the same way, and they don’t have adverse effects unless you have sensitive skin (we’ll get to that in a minute). In a physical sunscreen, you’ll find either titanium dioxide or zinc oxide. 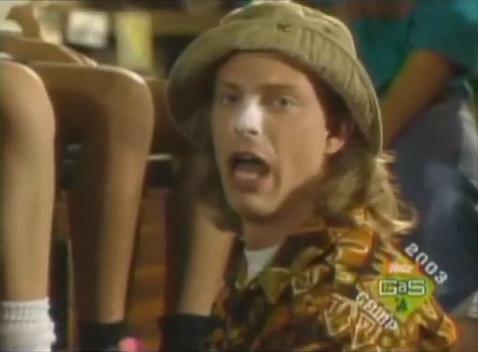 They don’t have notable side effects, aside from making a person look like Ug from Salute Your Shorts. 2. Different sunscreen ingredients combat different rays. Physical sunscreens are superstars because zinc oxide and titanium dioxide each protect against both UVA and UVB rays. Certain ingredients found in chemical sunscreens, like octylcrylene and octinoxate, do that too. When you’re looking for a chemical ’screen, check the active-ingredients list to find one that contains at least one UVB-fighting ingredient and one UVA-fighting ingredient. I know it probably seems hypervigilant to scrutinize labels for this stuff, but sometimes a label will claim that the product offers “broad spectrum” protection when it doesn’t actually have both UVA- and UVB-blocking ingredients. It helps to be informed. As for the inactive ingredients, that’s mostly stuff that gives the lotion its texture. At the very bottom of the ingredients list you’ll also find the preservatives, which are essential for preventing nasty bacteria and mold from growing in your product (and possibly on your face!). Most preservatives—even parabens—are safe in the teeny tiny amounts used in beauty products. BONUS POINTS if your sunscreen contains antioxidants, which you’ll also find among the inactive ingredients. Antioxidants are natural extracts and vitamins that boost your sunscreen’s efficacy. Vitamin E (alpha-tocopherol, tocopherol acetate), vitamin B6 (niacinamide), vitamin A (retinol, retinyl palmitate), vitamin C (this one has many aliases: ascorbic acid, L-ascorbic acid, ascorbyl palmitate, sodium ascorbyl phosphate, retinyl ascorbate, tetrahexyldecyl ascorbate, and magnesium ascorbyl phosphate), and tea extract (camellia sinensis leaf) are common ones to look for. I am so all about MAG THRASH: SUNSCREEN CORRESPONDENT. I am allergic to sunscreen, so ya know not very useful. The best protection is covering your entire body from head to toe and then sitting inside, in the air conditioning . Hi! Check out page two, where Maggie discusses and links to resources about this. I’m allergic to sunscreen (as well as deodorant and bug spray, which is convenient since I live in Florida), and a lot of people who are allergic to cheap metal, like nickel, are often allergic to sunscreen as well. I personally get hives, but reactions vary. Anyway, I can use the Neutrogena line of sunscreen, because it doesn’t have some of the irritants, but baby sunscreen is usually okay because it’s made for baby’s sensitive skin. Huh, gawd, sorry about that. Thank you! Fitting username btw. surely the sun is at the centre of the solar system? i guess it’s metaphorically at the centre of our universe but not literally. ditto galaxy. And thank YOU, Simone. I don’t know where my brain went there. somehow sunscreens make me look…tanner. I don’t know why this is happening. For everyone who gets a greasy face and maybe likes to wear makeup on top of it, the La Roche Posay dry touch gel cream works really nicely. It’s available in SPF 30 and 50. Just make sure to blend right away, because it can patch if you don’t (it really dries right away). Hey thanks so very much for writing this! Like you (I’m assuming), I’m pretty careful about this stuff because of where I live, and I’ve been using daily sunscreen for years (right now a really lovely chemical one called La Roche Posse anthelios 50+) which is light and makes my skin deathly soft. I wish Rookie did heaps more practical things like this. It can be hard to sort through good beauty things vs. the pseudo sciences. :) Loved every paragraph, well done! I live in Australia so I pretty much am constantly being exposed to too much UV. I have bad acne and couldn’t find a sunscreen that worked under makeup – I was too self conscious to go fresh faced. It’s not great for everyday, but for strong SPF coverage whilst at the beach, tinted zinc cream can be great. It looks a bit orange-y sometimes, but because it’s the beach you can get away with it. It also doesn’t wash off – bonus! My favorite sunscreen of all time is Sun Bum. The packaging is cool and summery, it smells delicious and even though I’m usually sensitive to fragrances it doesn’t bother me. The initial greasy sunscreen gross feeling goes away in a couple minutes and then it feels like you don’t have anything on at all. I checked the ingredients with this article and it contains UVA and B protection stuffs plus vitamin E. I love it cuz I usually wear it hiking and to outdoor music festivals and biking and stuff and I get compliments for smelling good when everyone else doesn’t haha. Kinda expensive though, like $15 bucks a bottle but worth it. I bought a moisturizer with SPF for the first time last week and my face feels so much better/healthier since I’ve started using it. Sunscreen is so important!!!!! Great article, Maggie. You must have aced chemistry. Nicely researched, and thanks for the useful links! They also have risk indicators on most cosmetics, and you can create your own ingredients report if a product you’re using isn’t in the database! In my plentiful research about sunscreen, I have found that all sunscreens are NOT created equal. Physical sunscreens — titanium dioxide and zinc oxide — are considered to be the “gold standard” of sun protection. Still, you DEFINITELY want to avoid certain sunscreen ingredients. The Environmental Working Group advises against wearing sunscreens that contain oxybenzone and retinyl palmitate. Oxybenzone is a chemical sunscreen that is believed to be an endocrine disruptor as well as related to photoallergic reactions. Retinyl palmitate also is associated with photoallergic reactions. It’s exceedingly difficult to find a sunscreen that has zinc oxide/titanium dioxide AND no retinyl palmitate. I went to a Walgreens a few weeks ago in search of sunscreen and couldn’t find a single one that met these requirements! The better sunscreens tend to be in the $8-$30 range and you’ll find them at places like Whole Foods. Seriously, do your research and don’t just buy whatever’s on the shelf. Much like other cosmetics, sunscreens aren’t too closely monitored by the FDA and companies can put pretty much anything they want in there. Yeah, I just wrote an essay about sunscreen. Whoops. Agreed. I only go for titanium dioxide/zinc oxide because of the controversy over the safety of oxybenzone. Hawaiian Tropic is kinda pricey here in Ireland but is my favourite. It smells like coconut heaven and is not greasy at all. (Yuck grease ew). They also have a “speshul” formulation for the face which has never broken me out!